The Blog Template #2 is used as a journal-style communication tool that are designed to serve readers with regularly published blog posts. The blog template will display all blog posts that are assigned to it. The blog template sidebar includes the option for viewers to filter by Categories, Authors, Archive, as well as subscribe to a blog RSS feed. You have the capability to create multiple Blogs which can then have their own blog posts. ie. 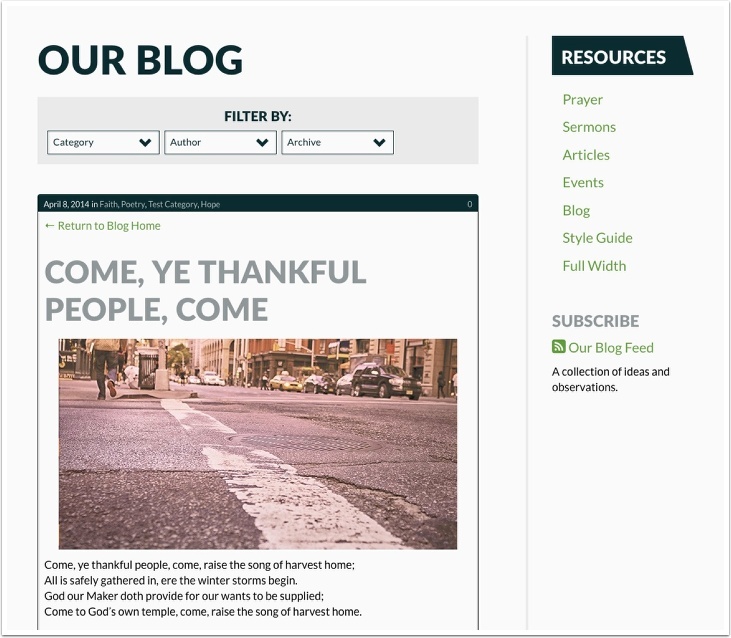 Church Blog, Pastor's Blog, Missions Blog. Your website is currently setup with 'Our Blog' in the navigation. If a new Blog is created, the Blog can be viewed in the website by assigning it a link in the Navigation. Don't forget to create Blog Posts and assign them to the new blog, otherwise the template will show up as blank. *NOTE - All images assigned to the image field in the media area should be 855px by 452px. The fields "Header Image" and "Header Background Video (mp4/h264)" have been added so you can add a custom header image/video as needed for the detail page. If these fields are not used the site default header image will be used. When a blog post is select from the blog template a blog detail view page will open to display the full content of that blog post. The blog post can host images, video embeds and links. 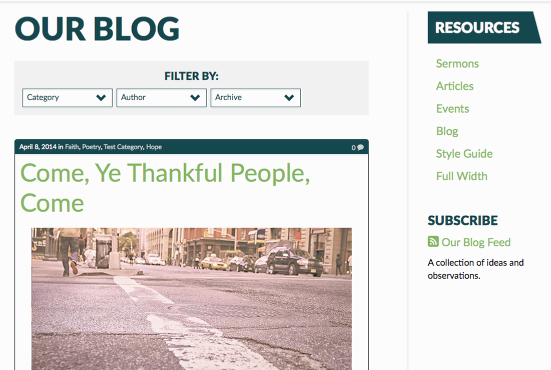 Visitors can login to the site to leave comments for a blog post from the detail view page. Once they log in and leave a comment the comment moderator will be alerted to approve or disapprove the comment. You can be notified by email when a comment is posted to a blog. To set up email notification for blog comments, visit Content > Blogs > [Blog Name]. Enter one or multiple email addresses in the "Comment Notification Email Address" field. Blogs are separate from Pages in that they live at their own URL, and all blog posts contained by the blog live under that location (i.e. www.mysite.com/the-blog-name/the-blog-post). Blog posts do not count toward the Page count.